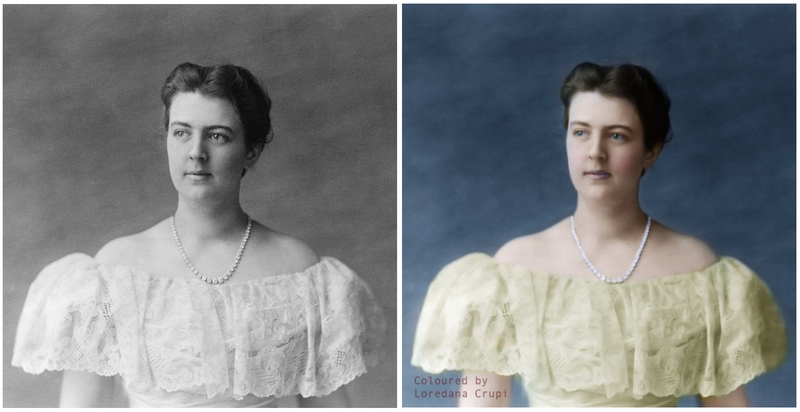 Frances Folsom Cleveland‘s claim to fame is that she was and still remains the youngest First Lady of the USA in history, having become First Lady at the age of 21. As wife of the US President Grover Cleveland, she was the 23rd and 25th First Lady of the United States from 1886 to 1889 and again from 1893 to 1897. Grover Cleveland was a longtime close friend of her father, Oscar Folsom. When Frances was 11, her father died without a will and so a court appointed Cleveland administrator of his estate. “Uncle Cleve” as he was known to Frances, watched her grow from a baby into a young woman. Cleveland proposed by letter in August 1885, soon after Frances’ graduation, shocking her widowed mother, Emma Folsom, who was mistakenly under the impression that it was she who was to receive a marriage proposal from the bachelor President! The White House issued a brief press release announcing the President’s engagement to Frances, just five days before the wedding. Frances was only 21 when she married President Cleveland, who at 49 was 28 years her senior, in a ceremony at the White House; the only President to have been married in the Executive Mansion. Known as ‘Frank’ to her family and friends she established herself as a social leader and ‘capable’ spouse, sharing her husband’s opposition to women’s suffrage, in favour of a celebrated role for women in the home. In 1908 after 22 years of marriage, and five children, Cleveland passed away. Five years later Frances Cleveland remarried Thomas J. Preston, a professor of archaeology at Wells College, achieving another first, this time, the first presidential widow to remarry. Frances Cleveland died this day, October 29, 1947 at the age of 83 in Baltimore and was buried in Princeton next to President Cleveland, her first husband. This entry was posted in Colorization, Colourisation, History, Photography, Uncategorized, USA and tagged An Honest President, Emma Folsom, Frances Clara Folsom, Frances Clara Folsom Cleveland, Oscar Folsom, President Grover Cleveland, Thomas J. Preston. Bookmark the permalink.